We are seeing more homeowners who want their counters to be thicker in appearance. A substantial edge on a counter creates a modern look but the aesthetic has crept into even some of the most traditional kitchens and baths and adds impact regardless of the style of the space. 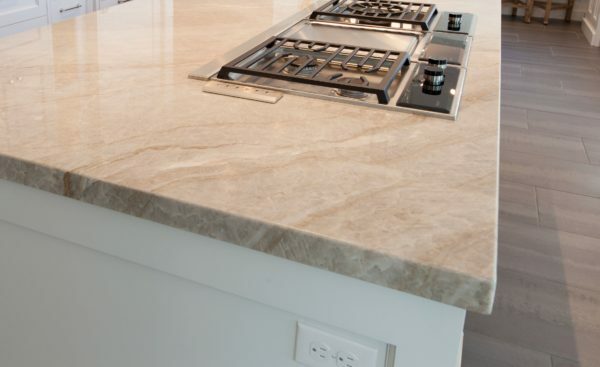 What most don’t know about these thicker counters is that they are actually a mitered edge. It is very uncommon (and costly) to have a stone slab cut at a thicker depth. It would make the stone almost unmanageable for installation and may even be too heavy for most cabinetry that would support it. 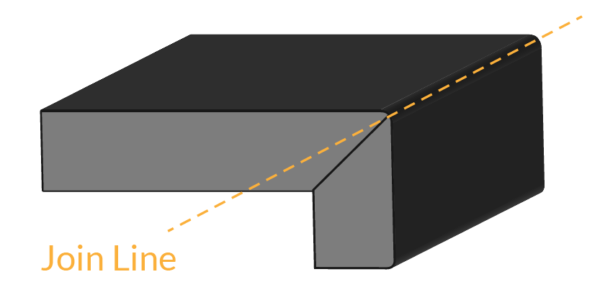 A standard counter thickness ranges anywhere from 3/4″ – 1 1/8″. To achieve the thicker edge two pieces of stone are cut at a 45 degree angle and joined together on all visible sides of the counter. The joints are barely visible even upon close inspection and give the appearance of a solid slab of stone. When done correctly the veining in the stone appears to continue over the edge, adding to the illusion. Because each counter is custom fabricated you can make the edge any thickness you desire but proper planning is key. 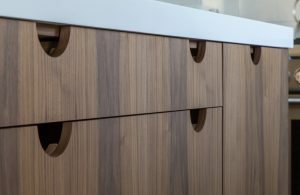 If you are considering a mitered edge counter for your next project you’ll have to inform your cabinet designer early in the planning process. Cabinet heights are usually based on standard counter thicknesses. If your counters are approaching 2+ inches or more in thickness it may affect the feel of the finished height of the counter. You will need to factor in your height and preference for a comfortable working height of your counters. 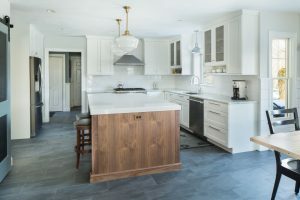 If the height difference doesn’t bother you then you may be able to stick with standard height cabinets but dependent upon the thickness you choose you may need a more custom cabinet base option to account for the added thickness. Your preferences should be worked out well in advance with your design and building professionals so all factors can be considered. Many of our clients opt for the mitered edge detail on only a portion of the counters in their kitchen. The photos below from our Lincoln Kitchen & Interior Project are an example of a mitered edge just on the island but standard edge thickness on the perimeter. 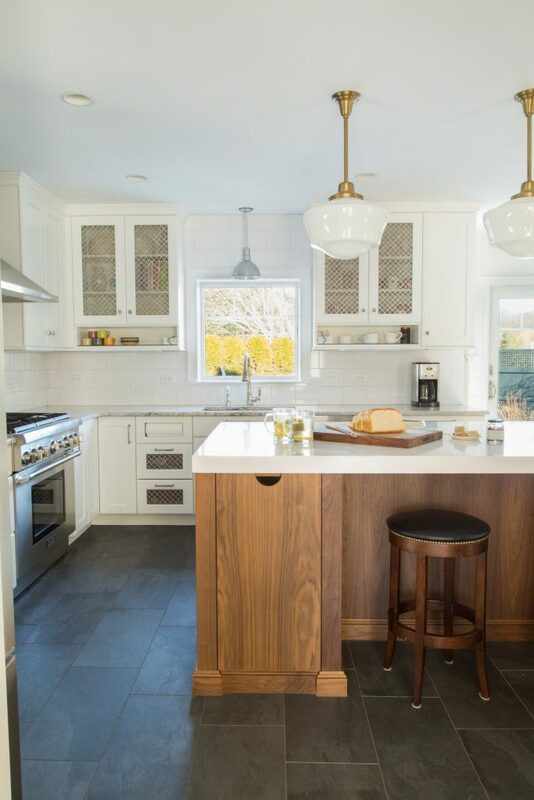 The white quartz center island becomes a beautiful focal point and the thick mitered edge is even more dramatic against the warm walnut wood tones of the island. If you’d like to incorporate a mitered edge countertop into your next project, contact us to start planning!